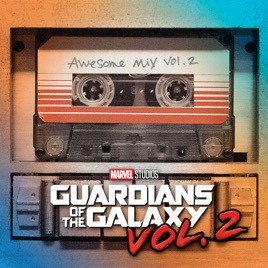 By dropping the needle on classic rock cuts and forgotten ‘70s pop confections, Guardians of the Galaxy flipped the conventional thinking of soundtracks on its head. The blockbuster continues this fine tradition on the sequel, pulling from a dusty crate of one-hit wonders and FM rock. Vol. 2 bounces along with ELO (“Mr. Blue Sky”), glam (“Fox on the Run”), power pop (“Surrender”), and more than one guilty pleasure (“Brandy (You’re a Fine Girl)”). Although some of the songs aren't as well know as the ones from the first album, I personally think that they are much better overall!